I grew up in a zoo. When you say it like that it doesn’t sound so good. My family lived in the Zoo Le Pal, where my father was a vet. Zoo Le Pal is in Dompierre sur Besbre, in central France. It was a wonderful time following my father around, watching him care for the animals – anything from treatments, giving fruits to the chimpanzees to raising orphan lion cubs with bottles of baby formula. I was fascinated by the diversity of wildlife. I think science was in my veins back then. My family valued education and I enjoyed an excellent education in France. I loved school and was an enthusiastic hard-working student who did very well, particularly in maths, physics and history. In those early years I decided I wanted to become a mechanical engineer or a journalist. In my last year of high school I became ill and was in and out of hospital. It destroyed my chances of competing for mechanical engineering schools which were the most difficult to get into, but through special consideration, I was able to get into a medical school in Clermont-Ferrand in central France. I did it purely to satisfy my anxious parents who felt that should anything happen to me, someone would cart me from the Faculty of Medicine to the teaching hospital next door. The last thing I wanted to do was to go back to hospital, even to work as a health professional. 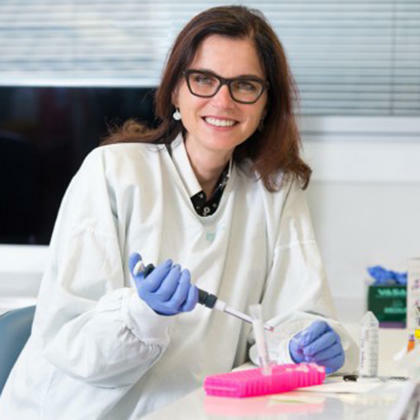 Professor Fabienne Mackay researches new potential treatment opportunities for leukemia patients. Picture: MedicalXpress. To my surprise I liked medical school and loved learning about the human body and pathology. I became very curious about diseases. Because I had been sick I had a strong urge to understand the aetiology of diseases, to figure out what has gone wrong. It captivated my interest. Diseases under a microscope looked like mysterious crime scenes with plenty of clues to explore. During my illness I experienced the unmet needs in medicine, particularly the lack of life-saving treatments. I was the lucky one who made it, but many of my friends in the hospital did not. I guess I probably got angry and frustrated. One day my doctor, who was also one of my lecturers, told me to stop whinging and do something about it. That was when I decided to enrol in a School of Engineering that specialised in biomedical engineering. I completed a PhD in Immunology in Basel, Switzerland, with Hoffmann La Roche, a global health care organisation. I loved it and was recruited by BiogenIdec Inc, a global biotechnology company based in Cambridge, Massachusetts. In 1999, my laboratory at BiogenIdec demonstrated, for the first time, that an excessive production of the factor BAFF was linked to the development of lupus. BAFF is a B cell activating factor that our bodies naturally produce. It enables B cells, which are a type of white blood cell, to make antibodies that are essential to creating a healthy immune system. However, too much of this BAFF factor can cause a person to develop autoimmune disease, particularly lupus. Discovering this was very exciting back then! They now had a therapeutic target to develop an inhibitor for this BAFF factor. In March 2013, a pharmaceutical therapy was developed and approved for the use of lupus patients after successful clinical trials. It would treat lupus with a novel approach. Existing treatments for lupus are not curative, often steroid based and made with highly toxic chemicals. Patients experience complications that are caused by their reaction to the chemicals, which can be problematic and sometimes fatal. Our new treatment has a huge advantage because it is far less toxic and easier for patients to tolerate compared to the existing harsh treatments that have been used for years. 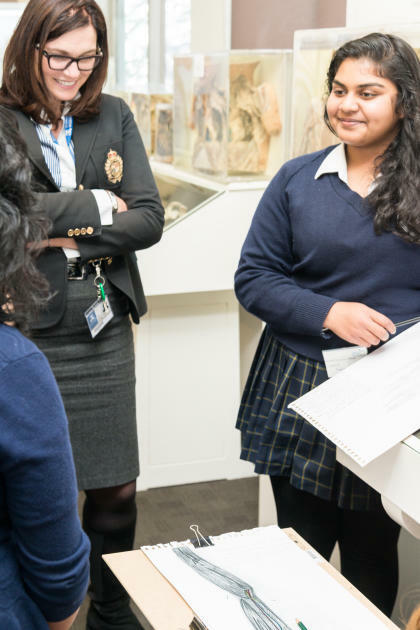 Professor Fabienne Mackay with secondary school students taking part in a one-day collaborative program with the School of Biomedical Sciences and the Gene Technology Access Centre. Picture: University of Melbourne. In 2000 I joined the Garvan Institute in Sydney where I was Director of the Autoimmunity Research Unit. I then moved to Monash University, where I served as Head of the Department of Immunology for seven years. I commenced my current role as Head of the new School of Biomedical Sciences at the University of Melbourne in August 2015. Initially, in my BAFF laboratory, we thought that BAFF only works on antibody producing cells. But we are now starting to discover that the BAFF system has other functions, new layers and new mechanisms that drive autoimmunity. We have, for example, discovered high levels of BAFF in the serum of leukaemia patients which has led us to investigate BAFF system in cancers such as leukaemia. We approach diseases like blood cancer with an immunologist’s eye, not a hematologist’s eye. Hematologists investigating leukaemia are interested in reducing tumour growth, while immunologists focus on what is compromising the immune system. In recent research we discovered that some immune cells get affected very early in leukaemia patients, even before the patients get sick. It gave us a sign that this early immunity defect will be the basis for immunity defects down the road and will compromise the patient’s ability to fight both infection and cancer. This can lead to death from infection rather than cancer. 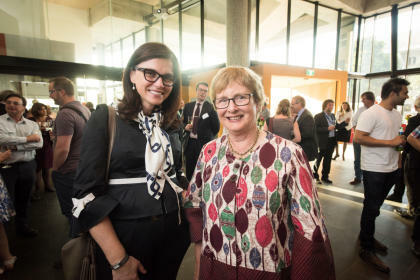 Professor Fabienne Mackay with Professor Suzanne Cory, keynote speaker at the launch of the School of Biomedical Sciences in October 2015. Picture: Taylor Made Photography. Cross disciplinary research such as neuroscience and engineering will open up new frontiers in nanomedicine. Advances in computing and ‘big data’ techniques now give us the capacity for higher level analysis to better understand bodily functions at the minute cellular level. Multidisciplinary collaborations that include industry will drive innovation and encourage higher rates of commercialisation, which will benefit both Australian research institutions and industry. This integrated approach is reflected in our School’s approach to research as well as teaching. To develop the next generation of outstanding biomedical scientists we need to equip our students with interdisciplinary research skills which will also provide them with a variety of career pathways into the burgeoning biomedical sector. We are seeing a revolution in biomedicine and it is an exciting time to be a part of it. It is enormously rewarding to have realised my dream of contributing to the advancement of human health with my own research that resulted in the first new treatment of lupus in 50 years. As Head of the School of Biomedical Sciences, my vision is to lay down the foundations for a new generation of biomedical research leaders to realise their own dreams of advancing human health.